Perhaps the subbing God is hinting me to "ease" into another genre to work on. Fortunately, I found a clip of my favorite comic, Itao Itsuji, doing what he does best--delivering off-beat jokes without cracking a smile. What more do you need? He even performs this skit in the traditional 落語 Rakugo style. 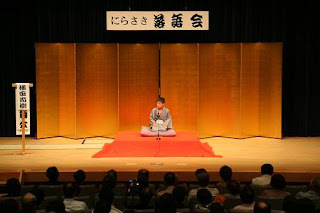 I wrote a little bit about Rakugo for a "Hotel" batsu episode. Good to see you enjoying yourself subbing again. I'm completely thumbs up for you picking random comedy videos to sub, gotta love itao. Once again, is there any chance you could provide a download link for the video? Thanks a lot in advance. Maybe you can try subbing mecha mecha iketeru episodes?